“If works of art carried as little social and political significance as some skeptics claim, would they be as hotly contested as they are, again and again? We can draw a mental timeline of iconoclasm from the statues and temples ISIS is currently smashing to pieces in Syria back to countless military campaigns, revolts, and regime changes in which the conquest of people went hand in hand with the plunder and destruction of their artistic treasures. Two exhibitions by Clemens von Wedemeyer and Dierk Schmidt highlight the political contentiousness of sculpture. The appropriation and exhibition of aesthetic objects is an inherent part of the struggle over dividing up the world. Schmidt examines the history of German colonialism, with a particular view to the politics of restitution and Berlin’s Humboldt Forum. 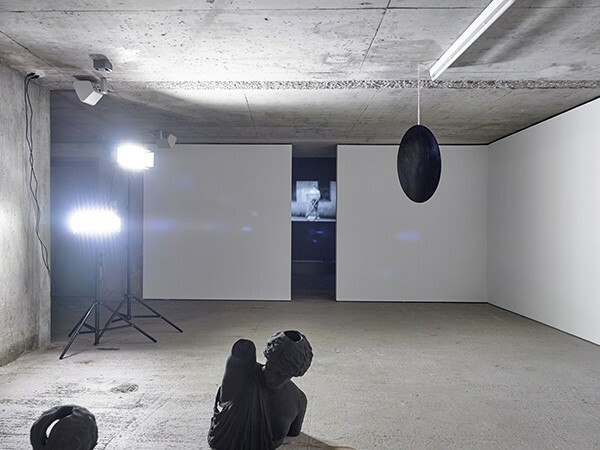 But first, Clemens von Wedemeyer explores the cinema as a social scene and battleground that unfolds upon—but also behind, in front of, and around—the silver screen; a project he has pursued since 2002 in an oeuvre that has increasingly expanded into the genres of documentary environment, architectural installation, and sculpture. Wedemeyer’s show is the eighth and final chapter in our yearlong program titled ONE YEAR OF FILMMAKERS. In the twentieth century, the moving image has dominated our field of vision and helped reshape how we see others and ourselves. The five-channel film installation THE BEGINNING. LIVING FIGURES DYING(2013) draws on the arsenal of scenes of conjuration and destruction in which the cinema has taken possession of the material images of man (and his gods and demons) by putting them on the screen. In a collage of historic footage, Wedemeyer traces how film staged the aura of bodily presence, animating objects and investing the human likeness with outsize magical power while also shattering it. A brief cultural history of sculpture in the movies in which Greek and Roman antiquity is the foil upon which the creation of a human figure as well as its demonization are projected, the video installation is also a historical catalogue of the implements of suggestion, the props, mockups, and effects, in which the cinema fabricated phantasms of the alien and menacing Other. 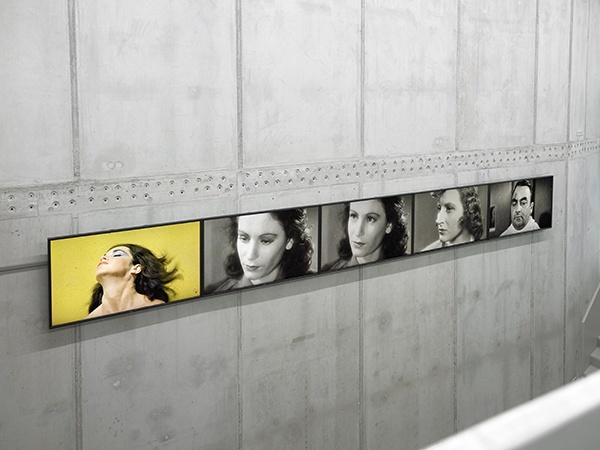 Wedemeyer’s exhibition builds on and extends the ensemble he produced for MAXXI in Rome. 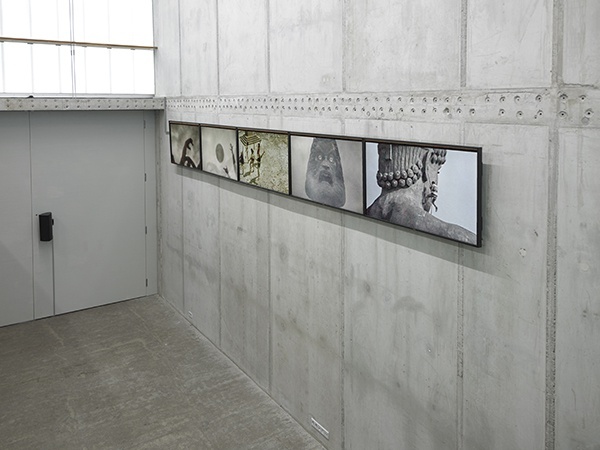 For the video installation AFTERIMAGE (2013), he created a detailed digital record of the interiors at CineArs, where props for Cinecittà, the hub of Italian filmmaking, have been manufactured since 1932—Cinecittà Holding is currently threatening to close the studio. 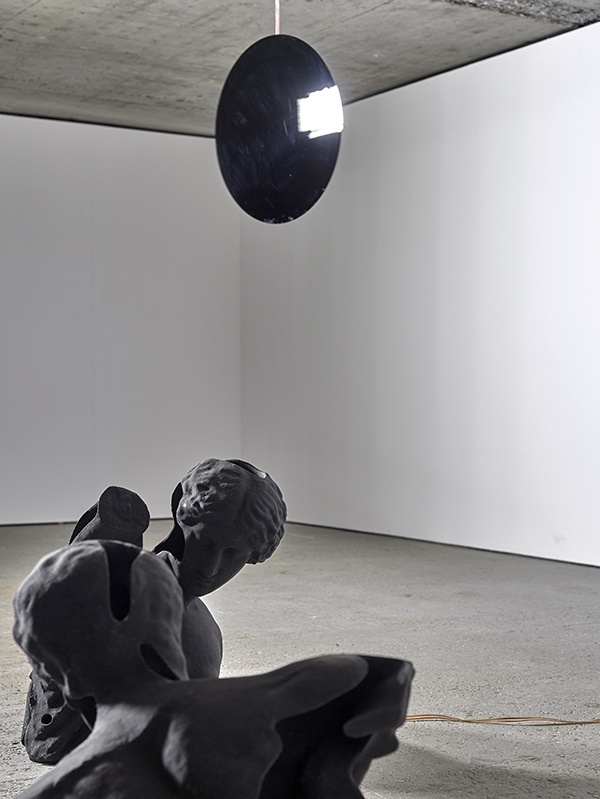 Two statues that he scanned now resurface in the gallery’s basement showroom as 3D sand prints (2015). 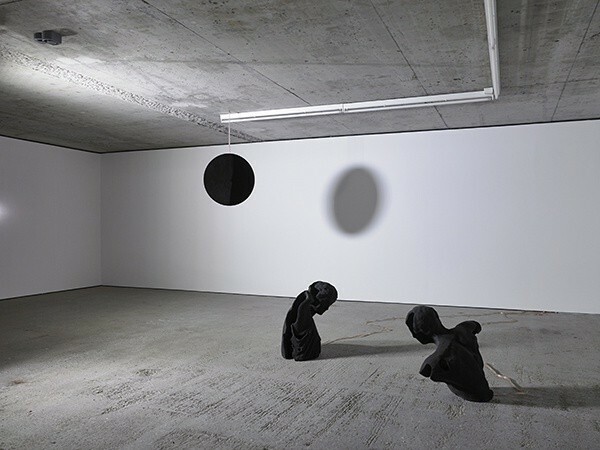 Resurrected by algorithms, the two sculptures embody a scene from Greek myth: after Zeus sent a deluge to destroy humankind for its depravity, Deucalion and Pyrrha were the only human beings left on the deserted earth. They consulted the oracle of Themis, who instructed them to cast the bones of their mother behind them. Initially baffled, Deucalion and Pyrrha eventually understood that they were children of the earth—so their mother’s bones must be the rocks at their feet. They threw them over their shoulders, and a young generation sprang up from the stones. A new humanity, born from dead matter. To make his sculptures, Wedemeyer harnesses techniques archaeologists use to reconstruct ancient temples and works of plastic art—and, in the future, to literally reprint objects destroyed in ravages like the one unleashed by ISIS in Palmyra. 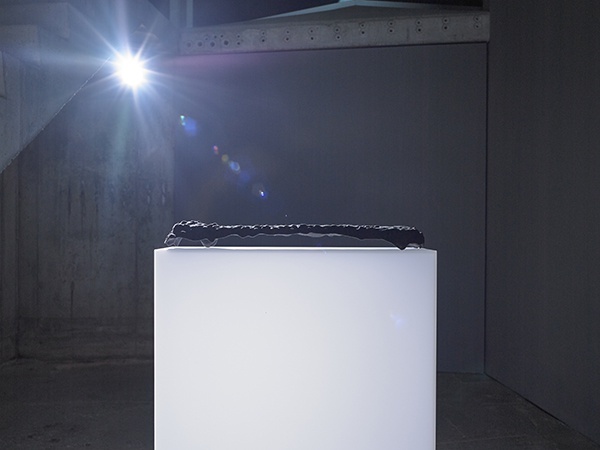 Iconoclasm is producing a new type of future artifacts from the past, artifacts that are clearly not what they once were and form a distinctive category of aesthetic objects. Another such object is A RECOVERED BONE (2014). In an act of digital theft, Wedemeyer lifted one of movie history’s most famous props from the screen and set it on a pedestal in the gallery. A key scene from Stanley Kubrick’s “2001: A Space Odyssey” tells the story of humankind’s earliest technological moment: a humanoid uses a bone as the first tool—and the first weapon—and then flings it toward the heavens in a gesture of triumph. Wedemeyer excised the object from the famous scene and reconstructed its shape using 3D modeling technology. The heavens are deserted, the bone is tangible, but each is as inauthentic as the other. Or is it? The entry 'Clemens von Wedemeyer' was posted on February 19th, 2016 at 5:47 pm	and last modified on February 19th, 2016 at 12:53 pm, and is filed under Uncategorized. You can follow any responses to this entry through the RSS 2.0 feed. Both comments and pings are currently closed.